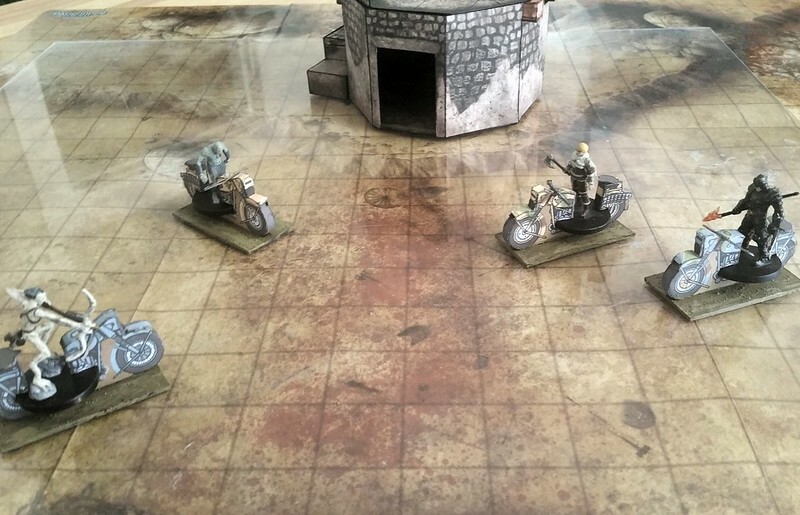 Y'all know I like to put minis in my models - buildings and vehicles especially. I couldn't find this adaptation yet in any motorcycle minis. As you know, that never stopped me. 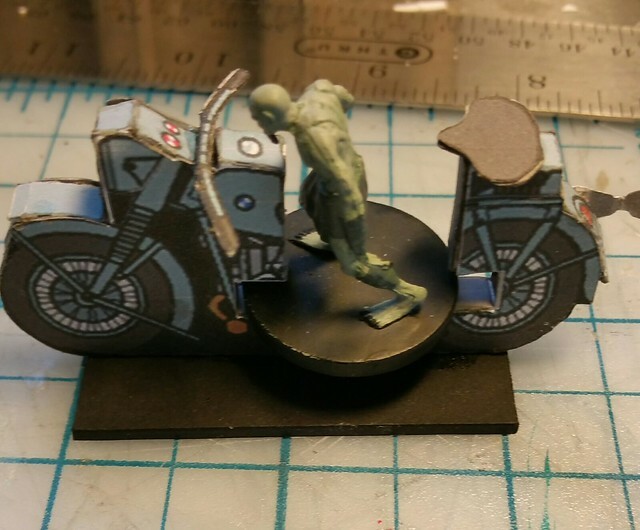 This thread will document my attempts to create a miniature paper figure for a motorcycle that can hold a standard 1" based figure in it's center as a "driver". I welcome all comments and suggestions along the way. 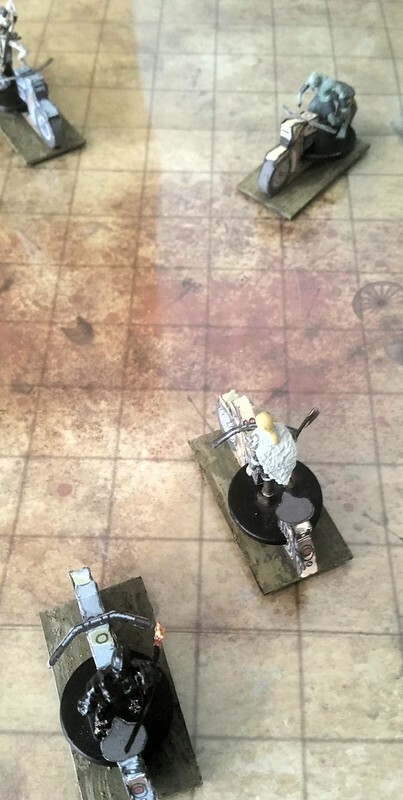 The correct scale for my minis has the model on the map at 2" long by less than 1" wide. 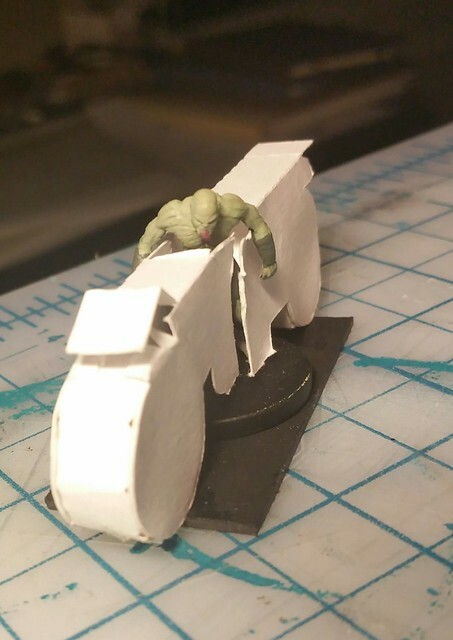 So I decide the first thing to try is make a solid mount out of paperboard. 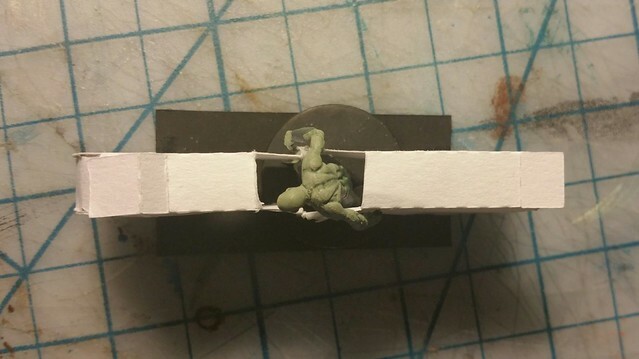 I will glue the model to this for stability and proper positioning on the play mat. 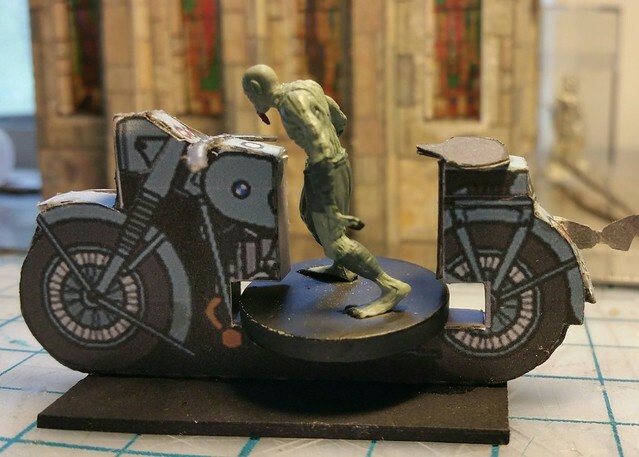 Initially I scale the model down by 55% (probably still a bit to large, given the photos below) but the tires will fit on the tile. Tracing just the tire and the body at this point, I can make quick paper (no ink) prototypes. Having only one mount point for each half of the bike is awkward and leads to alignment errors. Having the sides overlap the mini is an interesting idea, but makes it fiddly to load/unload, not good for game time. Considering just an open gap. 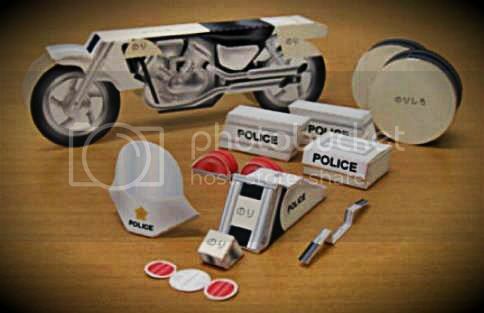 Where the rider "sits" is just a 'U' shape of paper, should really be a solid box, perhaps even closed. The model is too big. Next time I'll make it all fit in 2"
The rider is setting too low - after reducing scale and testing, consider raising rider from tile height. 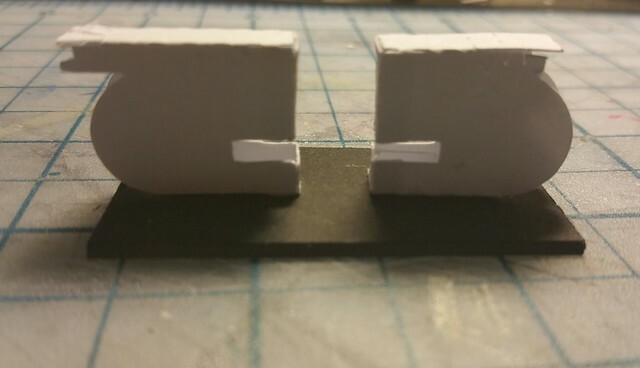 Prototype #2 - Two "solid" parts, dropped the sides/doors, scaled down to 2" total length, added standing slot. Yes! Grabbed all 3! Thanks! You got the jump on me , I was going to look into working on this today. 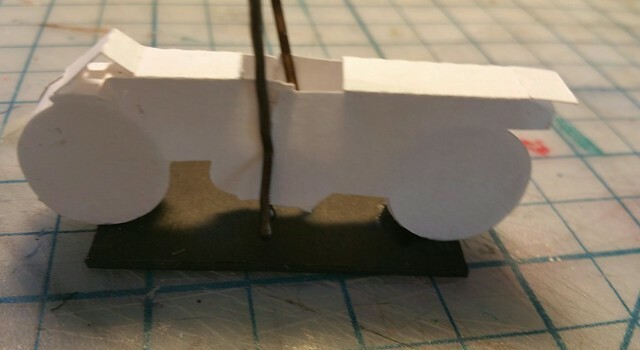 I'm liking how prototype #2 is looking to work out, it just comes down to applying a design on it, adding some ground ( grass or other) where the wheels aren't. I think you want the tabs in the middle of the "top side" grey as well, don't you? Great idea btw to have figs be able to stand in the bike. 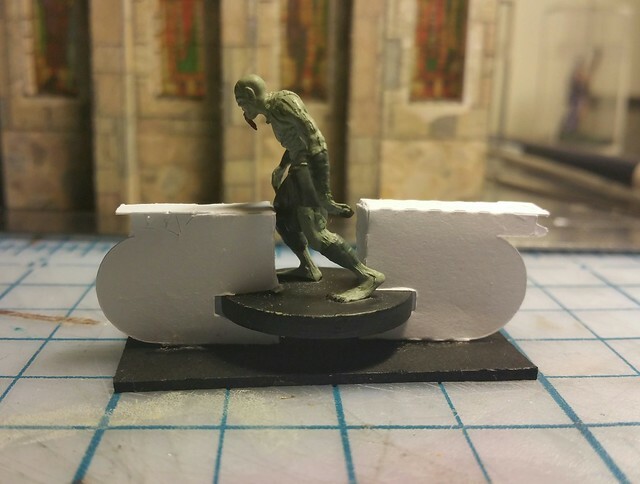 Quick build of Version 2.0 on a 1" wide by 2" long base... Unfortunately I don't have any miniatures any more that will fit, but this should be a good start. Updated .psd file with Grey, Desert Camo, Grey Camo, Red, and Sand colors and a headlight option and optional score and tab marking lines. @bearneart76 you've definately improved the idea with a one-piece construction. I really like that a lot. You've moved this design up a notch, but it isn't finished yet! Here's my build of Prototype #3 (Tom's one-peice model) with feeback and a cutfile! Turns out it doesn't work as-is with a mini because the mini keeps falling off! The mount is too deep/wide so the mini has to rest on a very small platform with nothing else to hold on to. See my "size" comment below for one possible solution. 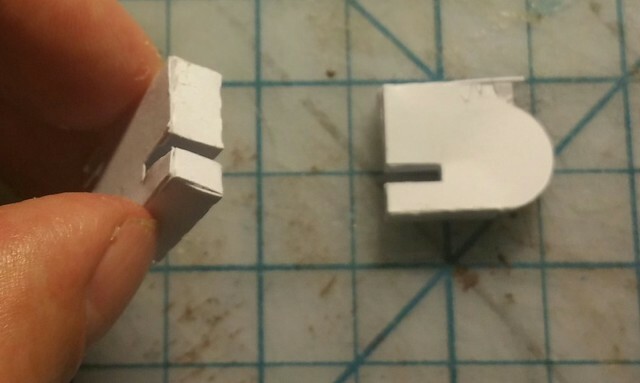 Also, the tabs need to be changed to glue easily around a rounded surface. Should be traniangles/trapizoids, not rectangles. Otherwise layers overlap awkwardly. See my cutfile for a trace you can use. The exhaust pipe is too flimsy without a back-side. Looks like it would be easy to mirror on the page. The grey tabs are on the wrong PSD layer (should be part of the cycle, not the tracings), so they disappeared when I wanted to print without tracelines. BTW - did you try black? That might look better, but I'm not sure. Thank you so much for jumping in on this - I love how strong this model is! We're almost there! Addressing the issues later tonight or tomorrow... Will also look at the sidecars for these as well. I'll get these fixed for version 3. There is a small section to fold back onto the tailpipe, I'll clear up instructions for that as well. On your build it wasn't folded back, probably because I forgot to have the fold line identified on version 1. I'll check version 2, but I am sure I have this issue corrected. I'll also add a black option. This has been corrected in version 2. I'll fix the slot issue as well, how does the size of the cutout work? It might work better scaled down to 80%.... it has been sort of challenging not having any actual mini's anymore to work with. I might also include an additional piece that's a bit wider to glue in the bottom of the slot. Cool! Dab o glue did the trick! I didn't know the target shape, so I missed that. 80% looks right for overall size, but the slot (cut out) needs more adjusting to the dimensions suggested. These are awesome! I need to see if there's some way to do something like this with some of Eddnic's quadrupeds or griffon. Break out your toothpicks and magnifying glasses..
4 up on one sheet, plus original design template. I left the handlebars a little thicker so they wouldn't get too fiddly. Scale looks a bit better now, scaled up an Armor Grid Light Infantry soldier to use for a rider. If you don't like the options I chose, remove the bitmap and merge something generated from Tom's originals. 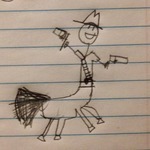 cowboycentaur, I made a hippogriff by mashing eddnic's griffon and unicorn together. The griffon legs were strong enough that I could just cut a little "x" in its back and stuff a plastic gnome figure up from the underside. I also had a dino rider hafling once. Both the dino and rider were out of paper. I drew his legs on the dino and had his upper body a detachable piece. I had a separate whole figure for when he was dismounted. you wouldn't happen to have a photo of the end result would you? those sound cool! I was thinking about this very thing before I took off for the weekend. 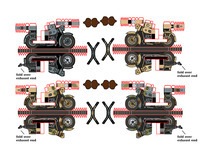 I was thinking about having 'footrests' across the center of the cutout and having the sides of the motorcycle be fold-downs. 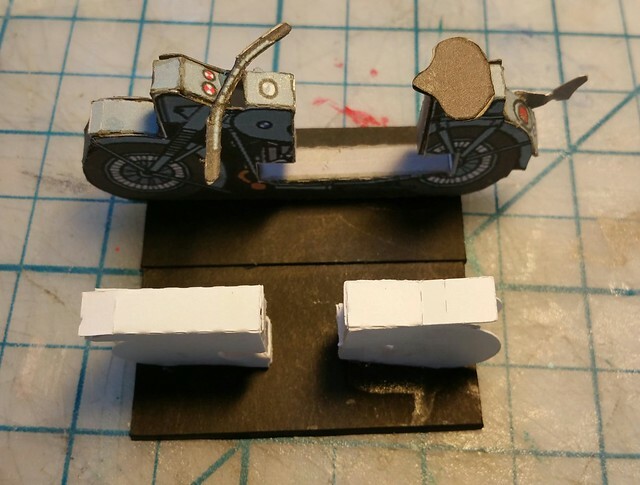 Flip them up when the motorcycle isn't in use, but then fold them down onto the footrest supports when using your figures, giving a larger base for the figure to sit on. Those are looking good oldschooldm! 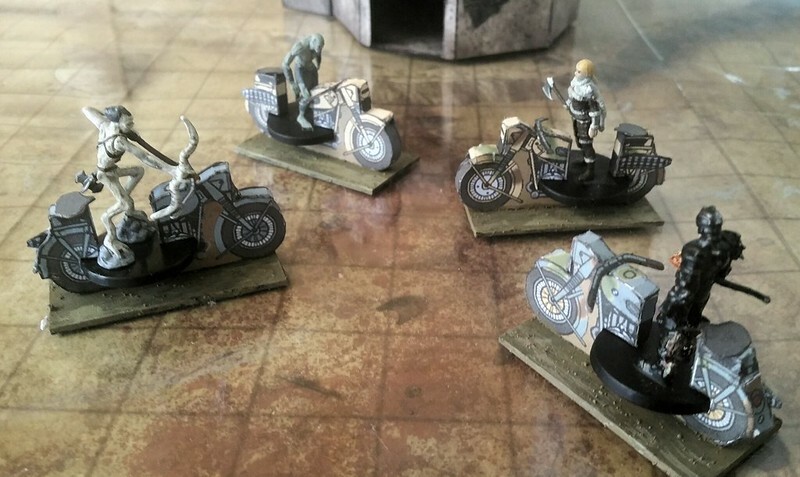 After I get the instructions for the Wooden Piers finished up I'll probably look at getting the sidecars and saddlebag/fuel cans and possibly different styles of motorcycles added on..
Oh my gosh those look so amazing. I agree completely, and want to thank berneart76 again for jumping in and taking this project to the goal line! Great detailed work! The dino rider I whipped up while sitting at the gaming table out of a business card and some markers. It lasted most of the campaign before it went the way of . . . well the dinosaurs. The hippogriff I still have but the gnome figure belongs to a friend. If I think of it when I have some time I will try to borrow one of my sons plastic figs and get a picture of it. I love the motorbikes. I've tried several similar ideas with horses over the years but never came up with anything very satisfying. Yes, that is the sound of a gauntlet dropping. Challenge accepted. But it will probably be done over the weekend. I accept this challenge gladly, from one cowboy to another.